One might well think that the only serious foreign policy imperative of the Donald Trump administration is to defend Israel. A president elected because he promised to put United States’ interests first has turned out to be little different than his predecessors, bowing to the power of various lobbies and constituencies to carry out their wishes while simultaneously pretending to be serving poorly defined policies to promote the security and well-being of the American people. Israel possesses, to be sure, the most powerful foreign policy lobby operating not only in the United States but as well in Western Europe and Australasia. When Israel makes its incessant demands, politicians from Washington to Canberra and Wellington pause to listen. In Britain, fully 80% of Conservative parliamentarians are members of the Conservative Friends of Israel. Israel benefits from a large, influential and wealthy community of diaspora Jews that is willing to do its bidding and which also possesses easy access to the media and to politicians, many of whom are more than willing to be corrupted by money. 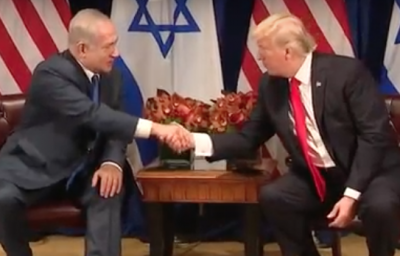 This has led to the creation of an “Israeli narrative,” most particularly in the United States, which glamorizes the state of Israel through the incessant reiteration of expressions like “the only democracy in the Middle East” and “America’s best friend and closest ally,” both of which assertions are completely false. It should surprise no one that the Trump administration is packed with Israel-firsters from top to bottom. Those who deal with Israel directly – Ambassador David Friedman, Chief Middle East Negotiator Jason Greenblatt, and Special Envoy and son-in-law Jared Kushner are all Orthodox Jews with long standing ties to Israel and its leadership. They are major financial supporters of Israeli “charities,” to include projects on the occupied West Bank, which are both illegal under international law and contrary to long established U.S. policy. It would seem, without being too hyperbolic, that Israeli interests are at least as important to them as are the American interests that they ostensibly represent and are being paid by the taxpayer to support. Within the White House, there is virtually no pushback against Israeli pretensions even when American interests are being damaged. Secretary of State Mike Pompeo has repeatedly voiced his support of the Jewish state and his animosity towards that state’s enemy of choice Iran. National Security Adviser John Bolton, a long-time neoconservative, has never distanced himself in any way from complete identification with the policies being promoted by Israel and its increasingly right wing and racist governments. Donald Trump himself has declared that he will be the best president for Israel ever, a pledge that he has worked to honor by moving the U.S. Embassy from Tel Aviv to Jerusalem in spite of the damage that it does to actual regional American interests. Philip Giraldi, Ph.D., Executive Director of the Council for the National Interest. He is a frequent contributor to Global Research.